Article on national self-determination in Scotland. Written by Iain MacSaorsa, Scottish Anarchist, number 3, the magazine of Scottish Federation of Anarchists. There is no denying Braveheart's power. It is a good film, very moving in parts, with a cracking story-line and excellent acting which makes it feel far less than its 3 hours length. The historical inaccuracies are unimportant as the message of the movie is independent of, for example, forgetting to include a bridge a river at the battle of Stirling. The film gets the basic story right and that's what important in this context. For those of you who have been hiding up a chimney for the last 6 months, Braveheart is about William Wallace and his fight for Scottish independence against King Edward the first of England (excellently played by Patrick McGoohan). Edward, after crushing Wales/Cymru, turned his state building vision to Scotland, where he used the in-fighting amongst the Scottish nobles to conquer Scotland. William Wallace, a very minor member of nobility, took up arms against the invaders and lead a successful peasant uprising against them until he was betrayed by Scottish nobles and hung, drawn and quartered. To begin to answer these questions, we must first define what we mean by nationalism. For many people, it is just the natural attachment to home, the place they group up. These feelings, however, obviously do not exist in a social vacuum. Nationality, as Bakunin noted, is a “natural and social fact” as “every people and the smallest folk-unit has its own character, its own specific mode of existence, its own way of speaking, feeling, thinking, and acting; and it is this idiosyncrasy that constitutes the essence of nationality”. But nationality is not the same as nationalism. Nationalism is far more, and a lot less ethically, than recognition of cultural uniqueness and love of home. Nationalism is the love of, of the desire to create, a nation state. Anarchists have long noted the fundamental difference between society and state. In fact, in the words of Rudolf Rocker, the “nation is not the cause, but the result of the state. It is the state that creates the nation, not the nation the state”. Every state is an artificial mechanism imposed on society by some ruler in order to defend and make secure the interests of privileged minorities within society. Nationalism was created to reinforce the state by providing it with the loyalty of a people of shared linguistic, ethnic, and cultural affinities. And if these shared affinities do not exist, the state will create them by centralising education in its own hands, imposing as “official” language and attempting to crush cultural differences from the people's within its borders. This can obviously be seen in Scottish history, when English Monarchs banned the pipes, the kilt and Gaelic. While imperialism often brings these attempts at cultural destruction into the stark light of the day, the same processes go on within a seemingly “whole” nation as well, the example of Yorkshire in England springs to mind. This is hardly surprising as the state is a centralised body, invested with power and a monopoly of force. It preempts the autonomy of localities and peoples and in the name of “nation” crushes the living, breathing reality of a nation (its peoples and their cultures) with one law, one culture and one “official” history. This does not mean, however, that anarchist are indifferent to national liberation struggles. Far from it. In the words of Bakunin, “I feel myself always the patriot of oppressed fatherlands … Nationality … is a historic, local fact which, like all real and harmless facts, has the right to claim general acceptance … Every people, like every person, is involuntarily that which it is and therefore has a right to be itself. Nationality is not a principle; it is a legitimate fact, just as individuality is. Every nationality, great or small has the incontestable right to be itself, to live according to its own nature. This right is simply the corollary of the general principal of freedom”. Unlike most nationalists, anarchists recognise that almost all “nations” are in fact not homogeneous and so consider nationality to be far wider in application than just lines on maps, created by conquest. With this in mind, anarchists think that recreating the centralised state in a slightly smaller area cannot solve what is called the “national question”. Further more, as internationalists, we hold that we “should place human universal justice above all national interests. And we should once and for all time abandon the false principle of nationality, invented by the late despots of France, Russia and Prussia for the purpose of crushing the sovereign principle of liberty” . Therefore it goes without saying that national “liberation” movements that take on notions of racial, cultural or ethnic “superiority” or “purity” or believe that cultural differences are somehow “rooted” in biology get no support from anarchists. Nationality is a product of social processes. Social evolution cannot be squeezed into the narrow, restricting borders of the nation state. As Bakunin noted, with respect to the Polish struggle for national liberation last century, anarchists, as “adversaries of every Stare, … rejects the rights and frontiers called historic. For us, Poland only begins, only truly exists where the labouring masses are and want to be Polish, it ends where, renouncing all particular links with Poland, the masses with to establish other national links”. Nationality, like any right, results from social life and is only to be concerned with itself when the right is denied. With this in mind, we must discuss an anarchist approach to the “national question” in Scotland, and by implication, elsewhere on our beautiful planet. We will not bother to prove that Scotland, like Wales and Ireland, is a colony of the English Empire and a separate country. For most thinking Scots it does not need to be argued, our rights to self-determination are denied. We will move on to the real core of the problem, what does independence actually mean today and what should the response of anarchists be to struggles for national liberation. When addressing the implications of independence, we must start from the obvious fact that any country has class and hierarchical divisions within it. Scotland is no exception, with 7% of the population owning 84% of the wealth. Obviously, if we are talking about national freedom we have to take into account the people who inhabit the nation. How wealth is disrupted will have an impact on society and the distribution of freedom within it. As Noam Chomsky indicates, “in a perfectly a perfectly functioning capitalist democracy … freedom will be in effect a kind of commodity … a person will have as much of it as he [or she] can buy”. Would a capitalist Scotland be fundamentally different for most people who would still be powerless economically and socially? Looking around the world at all the many nation-states in existence, we see the same differences in power, influence and wealth restricting self-determination for working class people, even if they are free “nationally”. These vast differences in power and freedom are just as true on the international level as it is within a country. Commenting on Clinton's plans for devolution of welfare programmes from Federal to State government in America, Chomsky makes the important point that while “under conditions of relative equality, this could be a move towards democracy. Under existing circumstances, devolution is intended as a further blow to the eroding democratic processes. Major corporations, investment firms, and the like, can constrain or directly control the acts of national governments and can set one national workforce against another. But the game is much easier when the only competing player that might remotely be influenced by the “great beast” is a state government, and even middle-sized enterprise can join in. The shadow cast by business [over society and politics] can thus be darker, and private power can move on to greater victories in the name of freedom” . The power of global capital has increased massively over the last 30 years, something which must be taken into account when discussing the social impacts of self-determination for Scots within a world capitalist framework (these important points are discussed in greater detail in issue 2 of Scottish Anarchist). The distribution of wealth, and so power, within a country has important implications for any national liberation struggle. Braveheart does make it clear that when push came to shove, most of the Scottish Nobles sided with their class brothers on the English side. In the 1707 Act of the Union, the Scottish Parliament happily united Parliaments in order to get better access to the English Empire and new markets and wealth. The interests of the ruling classes then were a-national, not much has really changed. National liberation struggles usually counterpoise the common interests of the nation and assume that class is irrelevant. It is what we will term the “Braveheart problem”, namely that nationalist movements, seeking in increase autonomy for certain parts of society but not for others. This does not mean, however, that anarchists are indifferent to imperialism, whereby one nation imposes its will on another. As Murry Bookchin notes, “no left libertarian … can oppose the right of a subjugated people to establish itself as an autonomous entity – be it a [libertarian] confederation … or as a nation-state based in hierarchical and class inequalities” . But saying this, we do not elevate this into a mindless article of faith, which much of the Leninist influenced left has done this century, and elevate opposition to the oppressor into calling for support for the oppressed nation without calling first inquiring into “what kind of society a given 'national liberation movement would likely produce”. To do so means to “support national liberation struggles for instrumental purposes, merely as a means of weakening imperialism”, which leads to “a condition of moral bankruptcy”  as socialist ideas become associated with the authoritarian and statist goals of the “anti-imperialist” dictatorships in “liberated” nations . The “Braveheart problem”, as Kropotkin noted in 1897, is the “failure of all nationalist movements … [which] lies in this curse of all nationaist movements – that the economic question … remains on the side”. For Kropotkin, socialists living in a country with a national movement have “a major task: to set forth the question (of nationalism) on an economic basis and carry out agitation against [economic and social] serfdom, etc., at one with the struggle against (oppression by) foreign nationality” . We will now contrast the anarchist approach to national liberation struggles with that of Leninism, the approach most commonly used this century. Lenin's ideas still hold relevance for much of the socialist movement in Scotland. The same point, namely that independence would be a step towards creating socialism, was made by Scottish Militant Labour (SML) and Liberation members at the recent Scottish Socialist Forum, recently held in Glasgow. These ideas imply two things, firstly a “stages” approach to the social struggle, and the first stage being to demand a Scottish nation-state and secondly, that such a nation-state would be “neutral” and could be used to “deliver” important reforms and even bring about socialism. The second of these myths was demolished in issue 2 of Scottish Anarchist, where the power of international capital and the non-neutrality of the state was discussed in great detail . Now we will deal with the first point. To suggest that the struggle for independence is a key to socialism within Scotland implies that, in the words of Bakunin, “a political revolution should precede a social revolution … [this] is a great and fatal error, because every political revolution taking place prior to and consequently without a social revolution must necessarily be a bourgeois revolution, and a bourgeois revolution can only be instrumental in bringing about bourgeois Socialism”, ie State Capitalism . Socialism was seen by most people at the Forum as something which the party “delivers” for people, from top down, by the actions of leaders, with working class people playing the role of passive voters. This “vision” was reinforced by numerous mention of the word “support” in the context of social struggles. Instead of the revolution of everyday life and the (often difficult) work of creating self-managed alternatives in our communities and workplaces, socialist activity is constrained and forced into the individualistic and atomising mould of capitalist politics. Utilising elections and creating “democratic” states, only leads to one thing, the “subordinat[ion] of the movement for economic emancipation to an exclusively political movement … They [the marxists] have tied the working class to the bourgeois towline” . That this is the result of electioneering can be seen from the history of Marxian Social Democracy, the British Labour Party and (more recently) the German Greens and should leave no honest investigator in any doubt. Socialism, for anarchists, is the self-liberation of working class people, by their own efforts, creating and using their own organisations. There can be no separation of political, social and economic struggles. The struggle against imperialism cannot be separated from the struggle against capitalism. In response to national oppression, the anarchist programme is clear, “it must not go towards constituting an 'intermediate stage' towards the social revolution through the formation of new national States. Anarchists refuse to participate in national liberation struggles. The struggle must spread to establish economic, political and social structures in the liberated territories, based on federalist and libertarian organisations” . That this approach can be successful is indicated by the actions of Nestor Makhno in the Ukraine during the Russian Revolution, to take just one example. Makhno, as well as fighting against both Red and White dictatorship, also resisted the Ukrainian nationalists. In opposition to the call for “national self-determination”, i.e. a new Ukrainian state, Makhno called for working class self-determination in the Ukraine and across the world. In the areas protected by the Makhnovist army, working class people organised their own lives, directly, based on their own ideas and needs. True, social, self-determination . Until such a time as a film about Makhno is made, Braveheart will have to do. It should be given credit for raising some important points concerning the struggle for national self-determination, although it does not really address them. We hope that we have done so here. So, so and see Braveheart, its an excellent movie. But also check out Ken Loach's new film Land and Freedom as well. This gives some sort of idea what social self-determination would be like as it deals with the Spanish revolution and what the struggle for freedom must also involve if its not to prove illusionary . For anarchists, “cultural freedom and variety … should not be confused with nationalism. That specific peoples should be free to fully develop their own cultural capacities is not merely a right but a desideratum. The world would be a drab place indeed if a magnificent mosaic of different cultures does not replace the largely decultured and homogenised world created by modern capitalism” . With this in mind, the work for anarchists within national liberation movements is clear. We must raise the “awkward” questions, we must as “independence for who?”, “freedom for what?”. We have to ensure that the moment when people start asking “who and what are we fighting for?” comes sooner, not later. For any cross-class national liberation movement this is the great fear and probably explains the SNP's fear of calling mass direct action (that and the deadening effects of electioneering on the spirit of revolt). Is freedom for abstracts like “the nation” or is it for the individuals who made up the nationality and give it life? Oppression must be fought on all fronts, within nations and internationally, in order for working class people to gain the fruits of freedom. Any national liberation struggle which bases itself on nationalism is doomed to failure as a movement for extending human freedom. And while we unmask nationalism for what it is, we should not disdain the basic struggle for identity and self-management which nationalism diverts. Nor must we passively wait for an abstract world revolution. Social struggle occurs in a given place on the surface of the planet. As we live in Scotland we want it to occur here. We must encourage direct action and the spirit of revolt against all forms of oppression – social, economic, political, racial, sexual, religious and national. And while fighting against oppression, we struggle for anarchy, a free confederation of communes based on workplace and community assemblies. A confederation which will place the nation-state, all nation-states, into the dust-bin of history where it belongs. Murray Bookchin, Nationalism and the National Question, Society and Nature, p.8-36, No.5, 1994, p.31 (This essay is an excellent summary of the anarchist approach to nationalism and is recommended for further reading). Needless to say, foreign intervention (as in the case of Vietnam, Nicaragua or Cuba for example) will just reinforce the authoritarian tendencies of the new states and so must, in general, be opposed. Alfredo M. Bonanno, Anarchism and the National Struggle, Bratach Dudh, p.12 (This is also an excellent introduction to this issue). For more information on Makhno and the Revolutionary Insurgents of the Ukraine, see Voline, The Unknown Revolution, and Peter Arshinov, History of the Makhnovist Movement. Both are available from AK Press. For more information on the social revolution in Spain, see issues 1 and 2 of Scottish Anarchist. Issue 1 contains an extensive book list for further reading. 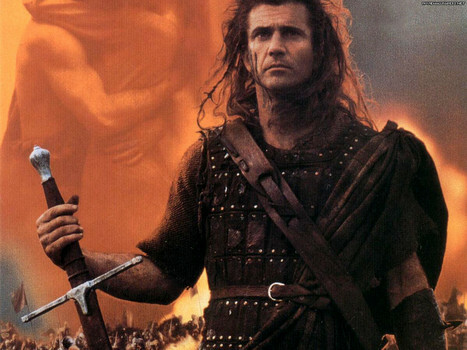 The published article was originally titled "Braveheart"
Yes but its quite a good article. Self-hating scotchery aside, it is an excellent film. Makes me lol everytime. Are they an active, current organization?